Investigate a murder in Sunnyvale! 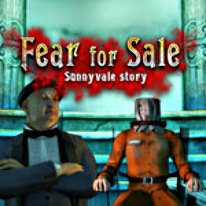 Take on another incredible mystery in Fear for Sale: Sunnyvale Story! Investigate a strange murder and get to the bottom of this complicated case. After arriving to the scene of the crime, a deputy is abducted by a terrifying ghost house that appears out of nowhere! Discover the connection between the latest murder, and another killing that occurred many years ago. Put your detective skills to use and appease the ghosts in Fear for Sale: Sunnyvale Story!